Hugo Chavez and the movement built around him rose to prominence and gained power with promises to end corruption, end abuse by police and army (the reaction against the use of the military during the 1989 Caracazo (and earlier events) was severe, to promote truly independent institutions (including the judiciary). and political reform. What have these years brought? Continued corruption, with new variations and new beneficiaries, continued and extended repression and violations of rights, epidemic criminal violence, destruction of independent institutions including the judiciary but extending to those that manage elections and others with escalating pressure on independent sources of news, information, and education, new heights (or lows) of mismanagement leading to high inflation, disinvestment, scarcity, visible decay of infrastructure and basic public services. Initiatives for political reform, centered most recently on the comunales, turn out on closer inspection to be mostly arrangements for top down control. “Questionable judgment “? What we saw in the streets of Caracas and other towns in Venezuela tells a different story: without Hugo Chavez and with Maduro being unable to motivate his own people, the chavista movement has lost it’s control of the streets, even in some of the poor barrios. 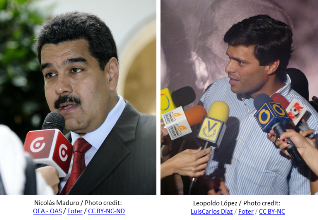 Leopoldo López is a very sophisticated organizer, so he is the first in the opposition camp to understand that they have to change from electoral to more aggressive ways of confronting the regime. Don’t underestimate this guy, and don’t underestimate the unity shown by him and Capriles and others, playing different roles and different styles of leadership. gives us a six of one half dozen of another view. But balance is not the same thing as objectivity which depends on facts.. Real objectivity depends on facts. Dan Levine is correct in speculating that when CLALS staff drafted the blog post we intended to put forth a balanced assessment. We always try to do that, and my sense is that it is especially worth doing in this instance, since so much that is broadcast over the internet, on the streets and in press conferences by both Chavista and anti-Chavista commentators is hysterical in tone and lacking in dispassionate analysis. I suppose that one way of reading what we came up with is that in seeking balance we put forth a “six one way a half dozen the other” sort of argument, but that wasn’t the intent and we don’t take the view that “objectivity” prevents one from taking sides. A review of recent AULABLOG posts turns up a good many cases – most, I think – where we aim to be objective about particular conflicts or disputes but conclude in our italicized third paragraph “punch line” with strong assertions about which side is getting it right and which is getting it wrong. Here, the point that we intended to make was that both the Maduro administration and the Lopez-led segment of the opposition are getting it wrong. They are escalating confrontation in ways we’ve seen before and that don’t serve the country (or the opposition’s goal of removing the incumbents from office) well. In that sense, yes, we said that one was six and the other was a half dozen, but it’s not that we took that approach in order to maintain balance and objectivity. I agree with Levine’s characterization of what brought Hugo Chavez to prominence and power and also what his regime has effected, but one could add other things to the list of accomplishments. In particular, one could add that Chavez and his followers have repeatedly won elections. This is important, because if the opposition aspires to reverse the negative panorama that Levine concludes “make one weep,” then in my view the single most important thing it has to do is to win at the polls. That is not going to be easy: the government has a strong base of popular support, and has no reservations about abusing the rules. But sometimes one has to play on a tilted field. The Chileans used the plebiscite to unseat Pinochet, and in 2016 the Democrats will try once again to retain the White House despite measures intended to disenfranchise minority voters in battleground states across the U.S. Our piece implied that Capriles has become increasingly cognizant of this reality, and that Lopez’s followers are undermining his progress. That is our interpretation, and I welcome Paulo Luers’ warning to us that it is a misreading. We shall see. Daniel Levine quite spectacularly misses the point of this blog post, which is to point out the ways in which (time and time again) the Venezuelan opposition are often their own worst enemies. As Eric observes, the reasons why the opposition repeatedly failed to unseat Chávez cannot be reduced to corruption or vote-fixing. Levine wants to have it both ways: admitting (because it is unarguable) that election after election that chavismo won were substantially free and fair, yet continuing to carp nonetheless. It all makes one weep. All the more thanks, then, to AULA for providing, even in this brief analysis, a welcome corrective and healthy dose of realism.